Not a movie, not a short. These are delightfully somewhere in between. 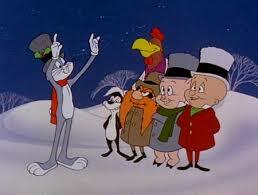 Produced, written, and directed by Chuck Jones; Production Design by Herbert Klynn. A TV special released in 1976. Lions: This part is drawn in a simplified style as we see a pride of lions heading off into a cave. Inside, only their eyes and roaring mouths can be seen. (Kinda creepy to be honest.) These are also some pretty lively lions. You’d think they’d be sleeping in the day. Roosters and Hens: Daffy and Bugs introduce this part by wearing gloves as combs. (Daffy still not get any any love) It’s a shame Foghorn couldn’t have made a cameo at this part. The chickens peck and crow. Aquarium: Bugs and Daffy seem to be having fun together now. (Bugs is speaking with Daffy’s voice for some reason) The music perfectly conveys the idea of submerging under the sea. (For the longest time I thought this was the “Harry Potter” theme. I’m glad I never told anyone they were the same.) Since they didn’t claim to only be fish, we are also treated to an image of a (demon) whale, a sea star, and a jellyfish. Finale: My favorite part! Something one can dance to! (Still my favorite part of “Fantasia 2000” Heck, I’d like a whole movie set to this music. But I suppose that would take a lot of the fun out of things. The music here kind of outright tells you what to picture, as opposed to letting you come to your own conclusions.) It’s like a Rhythm Heaven Remix with the animals of the previous pieces returning to strut their stuff one more time. Alright! Whose been waiting for this? *cricket chirping* I don’t mind that most of my fans are crickets. 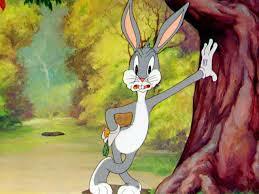 When we last left Bugs, he was now the #1 cartoon star in America. Chuck Jones says he was always concerned with his character. He established the fact that Bugs is a pretty easy going guy. Get him angry and it’s your funeral however. Fiz says that even with that, they still needed him to be fun to watch and listen to. After showing “Hair raising Hare” Friz tells about how he thought Elmer was an idiot. That’s why he created Yosemite Sam. We are then shown Sam’s debut cartoon “Hare Trigger.” We also are told that one thing that makes Looney Tunes so great is that they are fun to hear as well watch. After mentioning the not talked about enough Treg Brown and Carl Stalling, we learn that many live action stars helped model for Bugs. It also sings praise to some of Treg’s greatest sound effects. From the *Zrp* of a character running off, to the *fwefwefweefwefwe* of a character spinnig, to the *hubbida hubbida* of something going up and down fast. No doubt that his most famous was the *Bay Whoop* for iris-ing in and out. We also learn that Mike Maltese, Ted Pierce, and Warren Foster were the shilouettes that appeared in many shorts. Then we learn of the man himself, Mel Blanc. His debut in “Picador Porky” and Clampett telling us of his carrot allergy. They say that he was almost every main character. 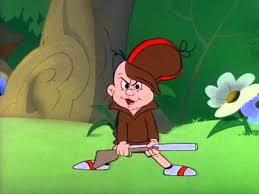 Except Elmer, played by Arthur Q. Brian. They even mention how Elmer was modeled after Bryan for a few shorts. (not the only time it’s happened. Remember “Wackiki Wabbit?” the castaways were caricatures of Mike and Ted. Thanks to SuperJNG18 for this tidbit) Finally we are left to wonder Bug’s future. Personally, I think he will continue to be the king of cartoons. For as long as the human race shall live. sorry for the wait. it was an expierament to see if anyone came here and would ask for it to continue. fun fact: no one did. so screw it. David Bowie gives reasons why he will not work with bugs and the great Mel Blanc explains how he created a voice for bugs to use. Steve Martin makes note that all comedy has been influenced by bugs and Chuck Yeager points out bugs doesn’t get hurt. Quincy Jones tells that bugs can get girls but he doesn’t want to, and Billy Dee Williams shows some of Carl Stallings talent with sound effects. This may be a weak entry but i doubt anyone will comment on it anyway.